The years between 1912 and 1999 saw tremendous progress in the development of Eben Ezer. During that time, Eben Ezer not only developed lasting relationships with different churches and groups in the Brush community, but it also provided Brush with a valuable resource that drew people into the community from all over the United States, indeed, all over the world. This page documents some of the progress that Eben Ezer made during that time. The generous donations of the friends of Eben Ezer have always been a greatly appreciated and important part of Eben Ezer's history. Because of donations and the help of volunteers in 1914, Eben Ezer was able to reduce patient fees, continue development, and by the end of the year, it was debt free. In the winter months of 1915 and 1916, Eben Ezer was able to build a new center for Christian fellowship. A large room was excavated beneath the annex to Bethesda, a 16x50-foot room that Rev. 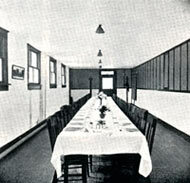 Madsen called "The Refectory," (pictured at left) or common dining room where sixty people could be served at one long table. 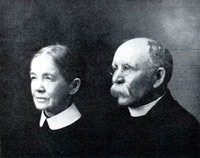 At mealtime, Pastor Madsen would sit with the brothers and male patients at one end of the table, while Mrs. Madsen sat with the Sisters and women at the other end. Visitors to Eben Ezer were seated accordingly. The project was intended to provide a temporary dining room, but remained in use for meals and meetings for over fifty years. When Elim Hospital (pictured at right) opened its doors in 1914, the facility was immediately busy. Although an obstetrics room had not been included in the plans, several babies were delivered that summer. One day, the Burlington train stopped at Eben Ezer instead of the Brush Depot, and the hospital admitted its first expectant mother. The mother was traveling by train to Iowa where she hoped to deliver the baby. She didn't make it. When it was evident that the baby was going to be born, the engineer stopped the train at Eben Ezer, and the crew carried the mother across the garden to the hospital. In the summer of 1916, three patients suffering from rattlesnake bites were admitted to Elim Hospital. One of them, Alphonso Lampe, was a young farmer who lived 20 miles from Brush. While picking corn, he was bitten on the finger. After making it back to his house, he collapsed and lay unconscious for five hours where a neighbor happened to find him. Unfortunately, Mr. Lampe lost part of his hand and suffered terribly, but he recovered after several weeks in the hospital. Elim Hospital was quickly becoming a valuable medical center for the surrounding area. Rev. 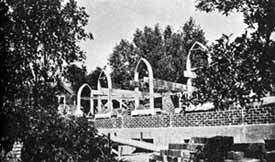 Madsen drew the final plans for All Saints Church (pictured at left during the laying of the cornerstone) with the help of a Denver architect named Baerrensen in 1916. The new church was designed as a miniature copy of the thirteenth century Danish Institutional Church. Members of the staff named it "All Saints Church" for several reasons. First, the name honored the people who had contributed to the building fund. Madsen called them "Saints of God." Second, the name was thought to include each "soul the Lord acknowledges as his own." Finally, the All Saints Church would be a "house of prayer for all people." In short, the church was not just for those at Eben Ezer. It was for "all the saints," hence the name "All Saints." Both exterior and interior walls of All Saints Church were built of coarse, wire cut red brick that closely resembled material used in the churches of Denmark. A gray Del Norte lava stone, cut in a Denver stone yard complimented the red brick. May, 1924, King Christian X of Denmark surprised everyone at Eben Ezer by awarding the Cross of the Knights of Dannebrog to Pastor Madsen. The King sent the beautiful emblem via the Danish Ambassador in recognition of the excellent work done at Eben Ezer. After Pastor Madsen wore the emblem at the next worship service, he placed it on the altar "with a prayer for God's blessing upon Denmark, its King, its land and people." In 1927, one of the most familiar landmarks in Brush was erected on the Eben Ezer grounds. A group of people donated the funds for a "more fitting and dignified entrance gate (pictured at right) in place of the old picket fence, which had rotted." Baerresen Architects of Denver were again contacted, and the impressive gothic arches were designed for both automobile and foot traffic. Those entering the grounds saw the words "Eben Ezer," while those leaving were reminded by the word "Mizpah" to pray, "The Lord watch between you and me and when we are absent one from the other" (Genesis 33:49). 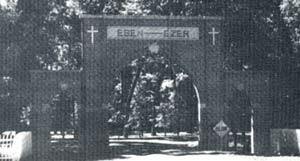 By 1928, Eben Ezer had gained a solid reputation for spiritual and medical care of the sick and elderly. In addition to their other tasks, the Sisters found time to pray with, or sing and read to, the patients and elderly residents. The reports of the July 1931 Annual Meeting showed that for the year ending July 1931, 480 patients had been treated in Elim Hospital. Of these admissions 218 were surgical and 66 were births. At that time, an average stay for a patient was 10 days. After World War I, however, the incidences of tuberculosis decreased, and fewer patients visited the arid climate of Colorado. 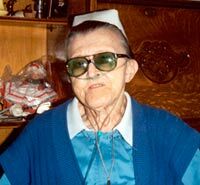 Several sanatoriums in the state were forced to close, but there were no such plans for Eben Ezer. 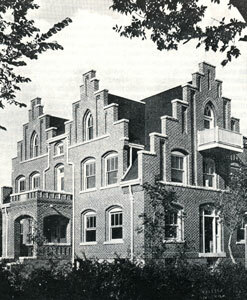 Pastor Madsen recognized that the sanatorium had served its purpose and began searching for new avenues. Soon the rooms were full with elderly and the disabled. During the spring of 1939, the Crown Prince Frederik, and Crown Princess Ingrid of Denmark visited the Eben Ezer grounds. The announcement of their visit was indeed a surprise, but a very welcome one. Plans were made and a celebration was scheduled, and when on April 18, the royal couple stepped from the train, they were treated to a reception of coffee and delicious Danish cookies, baked by the women of the community. The whole event lasted no more than an hour and a half, but to all - and particularly to all who had been born in Denmark - the experience of this short visit was delightful, a memory long to be cherished. To Pastor Madsen this event became the culmination of 35 years of service as his last official act was to introduce the royal guests to the multitude assembled on the lawn. A few days following the departure of the royal couple, Pastor Madsen and his wife left for a retreat home in the mountains. Besides giving them the permanent use of their apartment at Eben Ezer as long as they live, the Trustees also gave them charge of the Retreat House for as long as they wanted. The Madsens left their work at Eben Ezer as quietly as they had come, but throughout their thirty-five years of service they had a vision of what Eben Ezer could be and in a least part, they had seen it actualized. As it states in one of Eben Ezer's histories, "God had been good. His mercy had not failed and He had granted them to associate with many good and God-fearing men and women as the years had come and gone." Pastor Madsen died some years later on May 29, 1946. As Elim Hospital developed, it became a very important center for both health care and the education of area doctors. Indeed, in the early 50's, doctors in Northeastern Colorado held quarterly postgraduate clinics for doctors in the area. Held in the Charter House, these meetings provided educational opportunities for doctors in the Brush, Fort Morgan, Akron and other surrounding areas. These meetings brought a considerable amount of notoriety to Eben Ezer and the Elim Hospital, and in 1953 the Eben Ezer Board of Trustees voted to lease the hospital to the Brush Community. This move set the groundwork for what would become the Brush Hospital District, and it freed up Eben Ezer to focus upon long term care, which became the focus of its mission and defines a large part of Eben Ezer's responsibilities today. In 1957, Sister Anna Poulsen (pictured at right) was given the task of creating an "occupational therapy" program, a program later known as "recreational therapy." At the time, this was a new field in long term care, and Sister Anna spent hours traveling to other care facilities and studying with several Denver therapists. Her efforts resulted in a pioneering program utilizing crafts and activities designed to increase the activity of the patients and stimulate better physical condition. The result is that occupational therapy became a permanent part of Eben Ezer's care, and pioneered this type of therapy as a part of long term care in the state of Colorado. In 1994, Eben Ezer began construction of an activity center, which was named the "Sister Anna Poulsen Activities Center" in memory of Sister Anna's work.